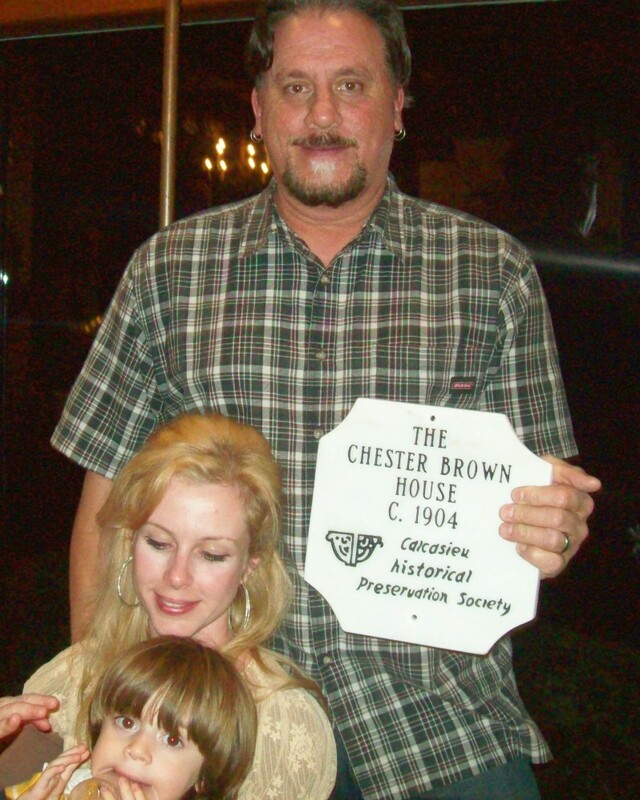 903 Broad, owned by Samantha and Randy LeJeune was awarded a Landmark plaque for 2011 during CHPS annual meeting on Jan 18, 2011. Chester Brown House 903 Broad Street c. 1904. The research for this house is fascinating. The Great Fire of 1910 has made it very difficult to look back for early Lake Charles history by the destruction of the Court House and its records. Levingston Land and Title has records dating back to late 1800’s that give clues regarding property sales, changes of ownership, and names of persons paying taxes that can be researched at the Clerk of Court’s office. The home was built in 1904 by Chester Brown, the treasurer of Ramsey Lumber Company, who lived there for only a few years before selling it. Chester Brown bought the lots from a man named Wood in 1903, who had acquired them from the old Henry Reid properties. Records at the Clerk of Court show George Locke purchasing the property December 28, 1912. The Locke family lived there for several years and when they left, the Louis G. Seiss family moved into the imposing structure. Louis Seiss and his wife moved to Hot Springs, Arkansas but left it occupied by his son John D., his wife, and their two daughters for 21 years. 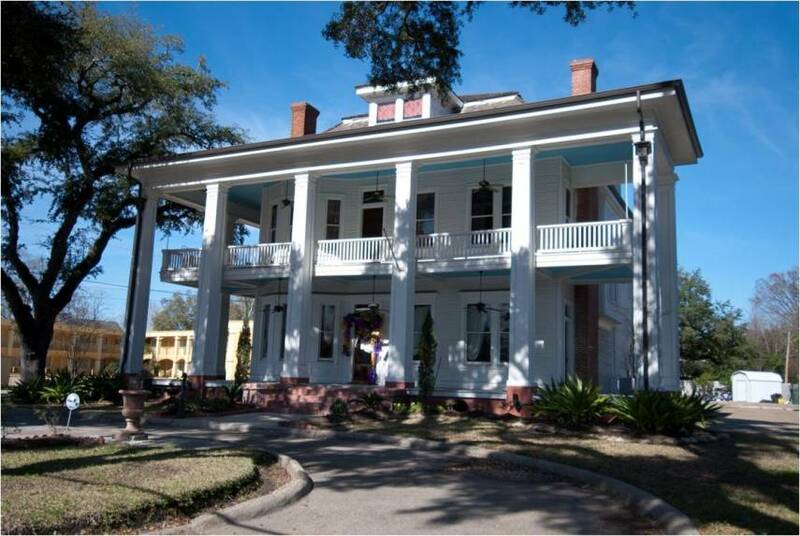 The home became the residence of E. T. and Pearl Ward in 1963 and she opened and operated Ward’s Plantation Restaurant. 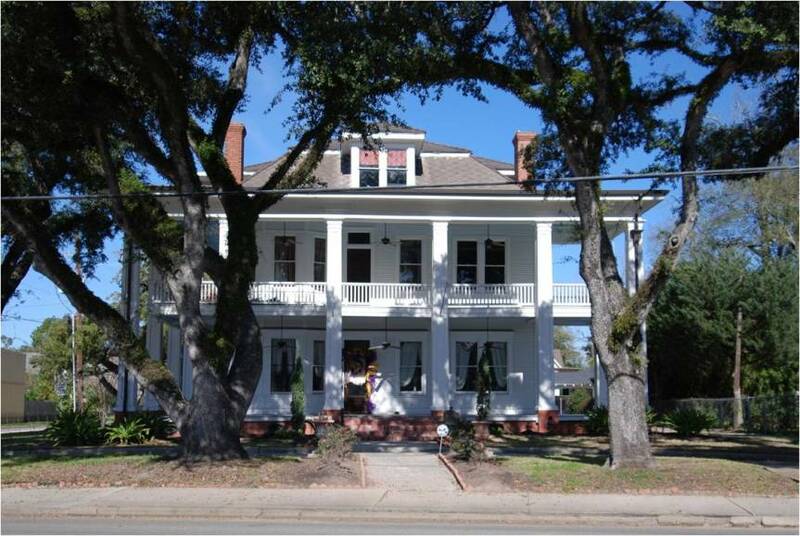 It was sold by Seiss heirs to Harold Guidry and Larry Hurst of Lafayette in 1968 and they continued to operate it as the Plantation House, a premier seafood restaurant. During this time, the porches were enclosed with glass, a bar was added to the East side, a brick dining room was added to the rear, and a porte-cochere was added to the front. Pearl Ward had moved East on Broad Street and opened the Aragon. In 1988, the Plantation House closed and two other groups tried under different names to operate the business but failed. It then became Hunan Inn until 2004. When it was a commercial establishment, no major changes had been made to interior room arrangements. Public rooms became dining rooms and upstairs bedrooms became dining spaces for small groups. On the first floor were located the living, dining and breakfast rooms, study, kitchen, and stair hall with a powder room beneath the first flight of stairs. On the second floor were two bathrooms, four bedrooms, and the hall with a dumb waiter. The stairs leading to the third floor are concealed behind a door leading to two large rooms in the attic. One had been used as a play room for children and the other for the housekeeping supplies and for sewing and mending. When Randy and Samantha LeJeune purchased the property in 2007, their goal was to return this very large building to its original use as a family home. They began by first removing the covered driveway at the front to expose the original façade, then all the glass and other changes to the massive porch were torn away and the real house emerged. Fortunately, since none of the room configurations had been altered, it became a matter of clearing the evidence of commercial use to reveal the four bedrooms as they once were. The three downstairs fireplaces are similar in style. Chimney pieces extend from the floor to the ceiling and have wood mantel shelves supported by four brackets. Mantels upstairs are of wood and brick and the chimney piece is shorter. The original light fixtures-chain and glass chandeliers-still hang from the ceiling. The porch for this monumental structure has 11 large square pillars with a fielded panel down each side and wraps around three sides of the house. This style is now known as a Lake Charles column. They stretch to a two story height and support a plain but full entablature. Overhanging this is a flat roof with boxed in beams. The house has a Mansard roof with four large dormers and the impressive second story gallery hangs suspended from the ceiling beyond the massive pillars. 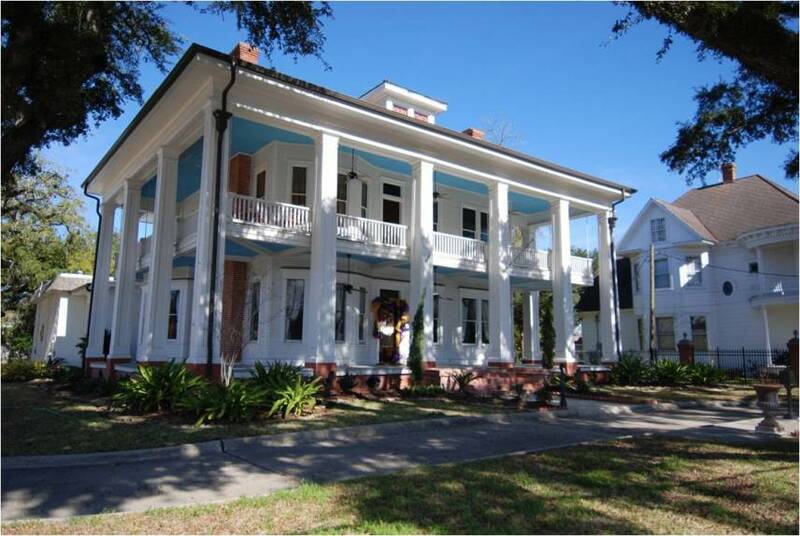 After the LeJeune’s finished the complete restoration, including stripping and refinishing the staircase and other woodwork and days of major cleaning, they opened the house to the public for the annual Calcasieu Historical Preservation Society’s Palm Sunday Tour. If you missed this event, perhaps you could ring the door bell and they would invite you in.